The basic element of a photovoltaic system is the solar cell. Modern solar cells are made in sizes up to about 6 inches square and are most often made from silicon, a semiconductor. The photovoltaic effect occurs when sunlight shines on the silicon, freeing electrons and generating an electric current. The electricity is collected and transported by metal contacts on the top and bottom of the cell. The current flows through a wire to provide electricity. A single cell produces only about 0.45 volts. It takes 36 cells connected in series to generate the voltage required for charging a 12-volt battery. The power produced in full sunlight is a function of the size of the solar cell and the efficiency (always getting higher as the technology improves). These cells are usually mounted (laminated with a clear plactic) behind a tempered glass sheet with the cells wired together to form a photovoltaic module (also called a” panel” or “flat-plate collector”). 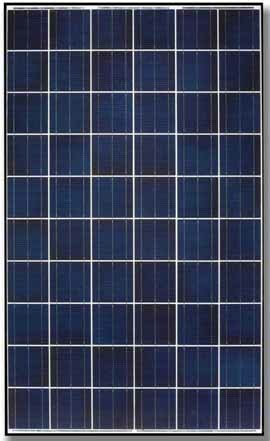 For instance, the most popular design in 2016 is to use 60 cells, each about 6" square, to produce 230 to 310 watts (depending on efficiency) from modules that are about 39" x 66". The rear of the module is sealed with plastic or glass for protection, long life requires a moisture tight assembly. The modules connected together for one system form an “array.” Large systems will have these photovoltaic modules connected physically and electrically in "sub-arrays". Single cells produce little power and are not often used individually. They can be found, however, in some items such as small yard lights. Arrays, depending on the number of panels used, can provide all the electricity for a home or even create a huge generating station. Modules or arrays are sometimes mounted on tracking systems, which follow the sun across the sky. These devices help maximize electricity production because sunlight shines directly on the PV modules throughout the day. Single-axis trackers move as the sun changes position from the east to west. Two-axis trackers not only follow the suns east to west movement, but also allow for its apparent change in attitude with different seasons. Trackers can increase the energy production of a photovoltaic system by nearly 40 percent, but the tracking equipment costs more than a simple fixed mounting. Electricity storage is a critical component of many PV systems. If power is needed at night or on cloudy days, solar-generated electricity can be stored in batteries. It is even possible to have large PV-powered homes, for example, it is not uncommon to find banks of 50 or more batteries. These battery banks usually store sufficient electricity to power the home through one or two cloudy days and nights. However, it is generally more cost effective operate larger photovoltaic systems inter-actively with the local electric utility. All photovoltaic, cells produce direct current (dc) electricity. That electricity can be used immediately if the PV cell is connected to a device designed for dc power – many refrigerators in recreational vehicles, for example. However most homes and appliances are designed to operate on alternating current (ac) electricity provided by utility companies. For applications, an inverter, which changes dc electricity to ac must be added to the PV system. If a system uses batteries, charge controllers are also important components. These devices protect batteries from excessive charge when the modules produce more electricity than the batteries can store. They also keep batteries from releasing electricity if their charge is too low. Without charge controllers, batteries suffer extreme wear-and-tear and become less effective, and last a shorter amount of time.